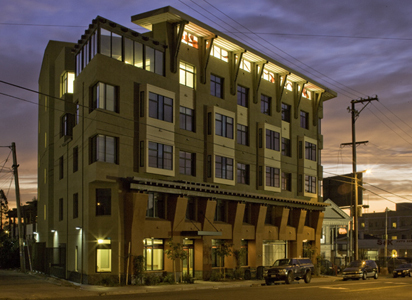 The Orchards at Foothill Senior Apartments is a 65-unit, modern Arts and Crafts interpretation. A glass walled parapet glows in the evening as back lighting underscores the bracketed overhang. On a half-acre site, this high-density project provides a variety of outdoor common spaces for its residents. A second-level outdoor courtyard overlooks the ground-level fruit orchard and vegetable garden toward the rear. Midway in the site, the building steps down from five stories to three stories with an open air corridor. 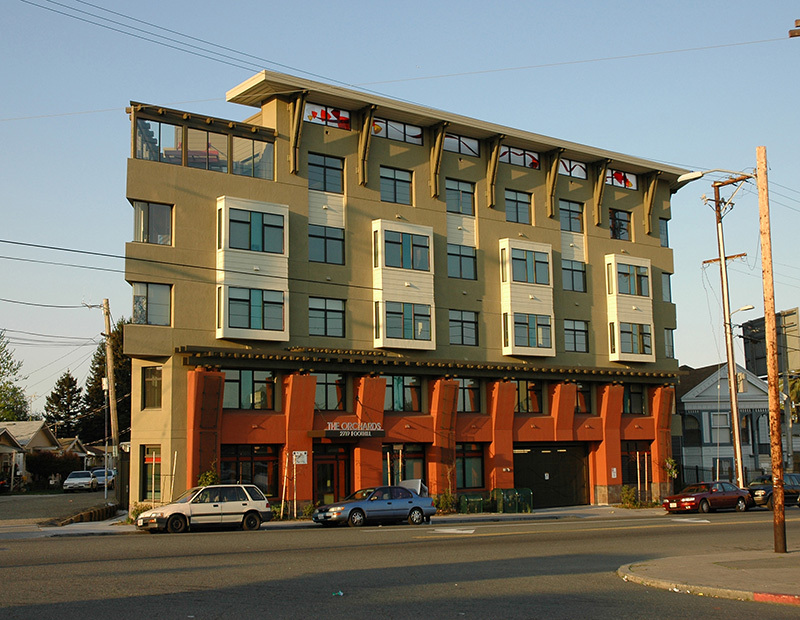 The northern half of the building has four-stories of stacked residential flats constructed on an ongrade single-level concrete podium enclosing nearly 12,000 square feet of space for parking and common areas The three-story building is ongrade with single-level units stacked throughout. The building structure features manufactured wood roof trusses, plywood shear walls, wood floor joists and concrete slab-on-grade with spread footing foundations, the structure above parking and below residential areas is post-tensioned concrete for the elevated slab, concrete columns and shear walls and slab-on-grade with spread footing foundations.